If you get a referral report for not meeting physical fitness standards, substandard job performance or disciplinary action, you can no longer get a 5 on your enlisted personnel report. This is one of many changes to the Air Force instruction that governs officer and enlisted evaluations. 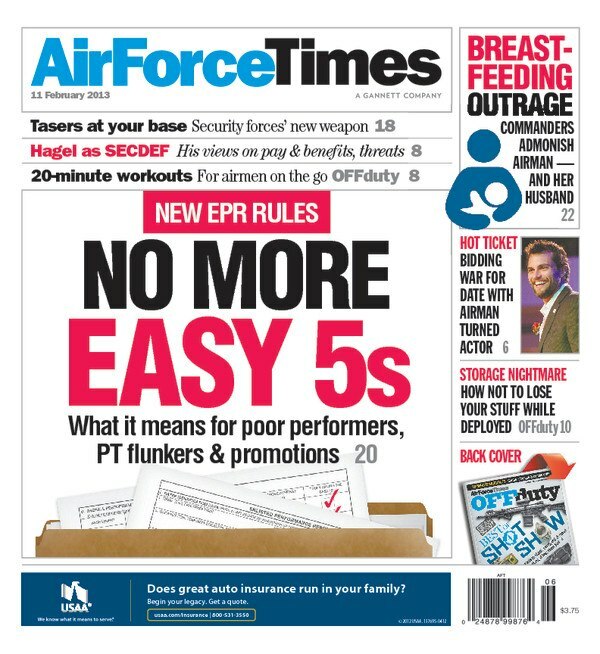 You can read more about what the changes mean for you – and your chances for promotion – in this week’s Air Force Times. Also this week: Security forces are being trained to use Tasers to replace batons as less-than-lethal weapons. Airmen who have volunteered to be on the receiving end of the 5-second jolt talk about how effective Tasers are at putting someone down. In the latest of Air Force Times’ ongoing coverage of breast feeding controversies, you can read about a former staff sergeant who said she and her husband were disciplined when she breastfed her infant while in uniform. On a more somber note, Air Force Times has a tribute in this edition to Capt. Lucas Gruenther, who was killed on Jan. 28 when his F-16 crashed during a training mission over the Adriatic Sea. “He’s the kind of officer who knows the name of every maintainer out there on the flight line,” his wife Cassy said in a statement.